Suppose we have x mod y, that's means we have to find the modulus or remainder. X mod Y. We want to find out the value of mod. We take the non fraction value, that means only 14 (Integer part of the result). Now 21 is the modulus value. Here 2 will go 12 times in 25. So Divisor 2 * Quotient 14 = 24 and then Dividend 25 - 24 = 1 Modulus. In simple word, Modulus = Dividend - Divisor * Quotient. Hope calculating modulus by simple calculation is now understandable. 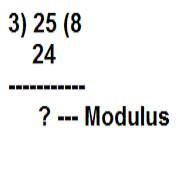 How to find modulus by simple calculation.At first, the question is what is modulus? Modulus is the remainder after division of one number by another number. Modulus is also called remainder. How to find modulus by simple calculation.